I got so much great feedback after my first “at any age” editorial, that I’ve decided to make it a regular feature! 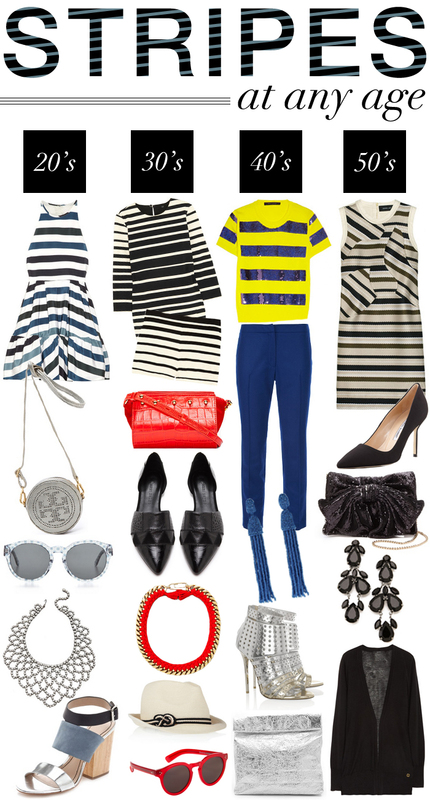 This edition features one of my favorite year-round staple print: stripes. Stripes can look youthful and also very sophisticated – you can wear a striped tee with jeans on the weekend or a sleek striped sheath + a cardigan to a work lunch. Here are looks for everyone – which is your favorite? Great post Merritt! Love the 30’s, 40’s and 50’s best! And while I am not 40 yet, I would rock the Marc Jacobs now!